Civilians are not – by law – allowed to wear any SA National Defence Force (SANDF) uniform including combat dress, better known as camouflage. “The SANDF is concerned by a growing trend among the public who, knowingly or unknowingly, either wear or are in possession of complete SANDF combat dress or items such as jackets and shirts,” Brigadier General Mafi Mgobozi, Director: Corporate Communication, said. The Defence Act of 2002 stipulates: “any person who, without authority, possesses or wears prescribed uniforms distinctive marks or crests, or performs any prohibited act while wearing such uniform or with such uniform, distinctive marks or crests, is guilty of an offence and liable on conviction to a fine or imprisonment for a period not exceeding five years”. According to Mgobozi the SANDF camouflage uniform has been registered for use solely by authorised members of the SANDF and by members identified by Chief SANDF and appointed honorary members of various SANDF units and/or bases. Colonel Ronald Maseko, SSO: Directorate: Corporate Communications, said the warning was not premised by any recent upturn in the wearing of SANDF camouflage by members of the public. “Military Police and the SA Police Service are always on the look-out for people wearing camouflage,” he said adding the fine handed down was dependent on the magistrate hearing the case. This would presumably include camouflage clothing having been thrown out and collected by rag pickers at either garbage collection points or dumping sites and people wearing stolen camouflage. People illegally in possession of either complete or items of SANDF combat dress are encouraged to return them to their closest SANDF base or unit, Mgobozi said. 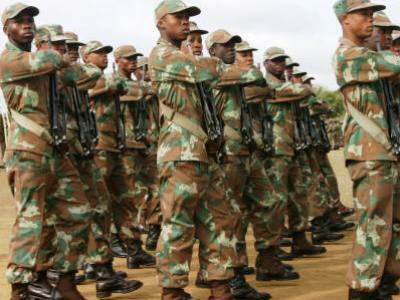 There have been many cases in the past of civilians wearing SANDF camouflage, especially for hunting. Military analyst Darren Olivier notes the law only applies to the current SANDF-specific pattern and not all camouflage, thus it won’t for example affect the ability of the EFF, ANC Youth League or MK Veterans Association to wear camouflage outfits at rallies. It appears wearing the old South African Defence Force (SADF) brown nutria camouflage is permitted.